There’s a Diablo 3 reward coming to Heroes of the Storm but only if you reach level 70 with a seasonal character in Season 4. The news comes as part of the latest Heroes of the Storm patch notes which offers a special in-game mount that can only be earned by playing Diablo 3 Season 4. Cross-game synergy! Diablo III and Diablo III: Reaper of Souls players who log in to Heroes during the three weeks following the release of the upcoming patch will permanently receive Diablo in Heroes of the Storm. 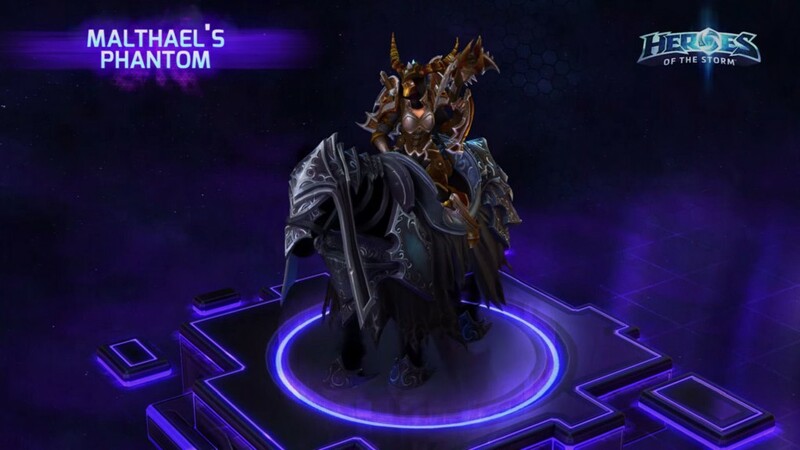 Starting with Season 4, Diablo III players who reach level 70 with a Seasonal character will receive Malthael’s Phantom in Heroes of the Storm. Diablo III players who reach Player Level 12 in Heroes of the Storm will receive a new Heroes-themed Portrait Border and Pennant in Diablo III. The Treasure Goblin Mount has been added for a limited time, and is exclusively available for purchase using Gold. Malthael’s Phantom has been added and will become available exclusively to Diablo III players who reach level 70 with a Season Character, starting with Diablo III Season 4. Blizzard also released a new video to show some of the upcoming HOTS changes which includes Maltheal’s Phantom mount and the comical looking Treasure Goblin mount. Probably also worth noting they're adding in-game rewards for D3 by reaching level 12 in HOTS. Also, D3 players who log into HOTS within three weeks of the new patch unlock Diablo for free. Thanks, added in the details about the D3 in-game prizes. That's great I haven't gotten Diablo yet in HoTS (sorry he wasn't as compelling as the fembarb) Level 40 in HoTS (max) so I get some free stuffs quick-like and going to do Season 4 I suppose. All good stuff to me! Dammit, Blizzard. I don't have time to play HOTS *and* D3. But now you've tempted me to play more HOTS. Good thing I have nothing on the schedule for this weekend. you can reach lvl 12 easy ? so do we have to wait for patch 2.3 for : Portrait Border & Pennant Diablo III players who reach Player Level 12 in Heroes of the Storm will receive a new Heroes-themed Portrait Border and Pennant in Diablo III.??? I was saving up nearly 10k gold for a warrior class hero. With getting Diablo for free, it seems problem solved for me. I feel sorry for the brothers out there who already purchased it. Did they fix his kick yet?